Bonamici, Schrader are optimistic at Westside Economic Aliance forum as Nov. 6 election nears. Two of Oregon's representatives say the U.S. House will function better if Democrats win a majority in the Nov. 6 election. Suzanne Bonamici of Beaverton and Kurt Schrader of Canby have differing approaches. Schrader has been critical of Democratic leader Nancy Pelosi, who would be line to reclaim the speakership she lost in 2010, when Republican won the House. Bonamici has not said much. "We have to change those practices so that Congress is more like the people we represent who expect it to work," said Bonamici, who is seeking a fourth full term from the 1st District, which includes Washington County. "I think you are going to see Congress functioning a lot better when we make those changes and have input from both sides of the aisle." Schrader is seeking a sixth term from the 5th District, which extends from Clackamas County into the mid-Willamette Valley and central coast. He takes pride in building relationships with centrist Democrats and Republicans — and is part of the No Labels movement. "I will tell you that if we are successful in this, it's going to look worse before it looks better after the election," he said. "But if it looks chaotic, that's a good thing, because it means we are upsetting the applecart. It's not going to be business as usual." Oregon's four Democrats and one Republican are likely to win re-election. Democrats will need a net gain of 23 seats to win the House. Schrader said that the current Congress in the first two years of Donald Trump's presidency has accomplished some things, including a two-year budget that Trump signed before he said he would not do it again. 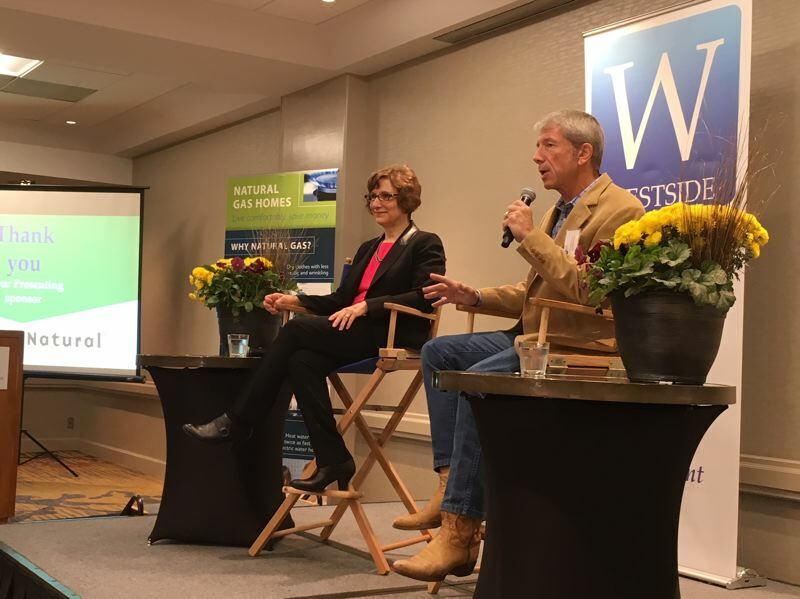 Bonamici and Schrader told the audience at Embassy Suites in Tigard that change could result in House action on a variety of issues ranging from federal spending on transportation and public works to climate change, immigration, education and health care. Partisan disagreements have stalled renewal of federal aid to higher education and adjustments to the Affordable Care Act, which Republicans have sought but failed to repeal outright. The next two-year congressional cycle will face a renewal of federal spending on transportation — and Wilsonville Mayor Tim Knapp said state and local governments need federal aid in addition to what is authorized now in the 2015 law, which allows only small increases. The current federal fuel tax is 18.4 cents per gallon, set back in 1993. Oregon is among the states that have raised fuel taxes in recent years. Despite support from groups as different as the U.S. Chamber of Commerce and the AFL-CIO labor federation, Congress has not raised the tax. "There are people there who have pledged they will not under any circumstances raise anybody's taxes," Bonamici said. "I have said there is broad bipartisan support for raising gas taxes everywhere except Congress." Trump has proposed an aid package, but it would reverse the ratio so that state and local governments would have to put up 80 percent for projects, matched by 20 percent in federal aid. But Schrader said Oregon's Peter DeFazio is in line to lead the relevant House committee if Democrats win a majority — and there are Republicans willing to raise more money for roads and other public works. "Other nations are eating our lunch right now in developing their multimodal infrastructure. The Highway Trust Fund is inadequate," Schrader said. "The sweet spot for Republicans and Democrats is to ensure that everyone pays in a little bit." Bonamici said she still prefers comprehensive legislation, but there is a bipartisan majority ready to pass a bill to shield from deportation the young immigrants known as "dreamers," who were brought to the United States illegally as children. However, Trump has insisted that any bill provide money for a border wall with Mexico — a wall Democrats oppose. "That would be the challenge" should any bill pass, Bonamici said. Schrader said he felt the House could have passed the same comprehensive bill that the Senate did in late 2013, but House Republican leaders declined to bring it to a vote. "Now I am a little worried abut the Senate becoming more conservative, perhaps more so after this election," he said. Although Republicans lead Democrats, 51 to 49 — counting two independents who vote with Democrats — Democrats can gain a majority only by holding on to all of their 26 seats up Nov. 6, plus win two of nine seats now held by Republicans. Democrats winning a majority in the House will not affect Trump's stance that climate change is a "hoax," but it might thwart his administration's efforts to promote coal. Schrader said utilities already sense that public sentiment and market forces are shifting away from coal and toward renewable sources. "As an adult and as a parent, I want to leave this place a little better than when I got here," he said. "I don't want to make it worse, but that is the legacy we are leaving right now." Bonamici said action has been stymied because Republican members of the Science, Space and Technology Committee she sits on are skeptics, including its retiring chairman. But a recent report by the Intergovernmental Panel on Climate Change warns of dire consequences in a few years if nations fail to act soon — and Bonamici said there are Republicans willing to join Democrats. "It should be yet another wake-up call that it is time to take action," she said. "The message is clear. We have to do something about it." Oregon Reps. Kurt Schrader and Suzanne Bonamici say change is coming to the U.S. House. But it's still an open question about whether Democrats can gain the 23 seats required to win a majority, which they lost in 2010. "The good thing in this election, no matter what party you are from, is that the numbers are going to get closer," Schrader said. "To get anything done, it's going to require people to work with the other side of the aisle. One group on the far right or far left is not going to be able to hold people hostage." Bonamici is hoping for a clear Democratic takeover, not continued rule by Republicans. "I do not want to think about that at this point," she said after their joint appearance at a Westside Economic Alliance forum. "Even if that happens, as I've done in the past six and a half years, I will build partnerships and do the best I can to get things done on behalf of the people I represent. However, I think everyone will benefit from these changes (planned by Democrats) that will result in a more democratic process."